I was avoiding Windows Vista almost to the bitter end. I only installed the 64-Bit Ultimate edition in September 2009 on my new notebook in anticipation of getting the free upgrade to Windows 7 Ultimate later that year. Yes, Vista sucked and I knew why I was doing myself a favor avoiding it at all cost. 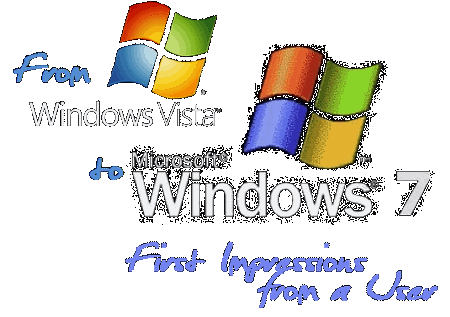 Many of the severe issues Vista had when it started were fixed. I used a version with SP1 and most patches before SP2 was released, so I don?? ?t even want to know what users of the pre-SP1 versions had to endure. I never installed a beta version of Windows 7, but from what I heard was this OS version looking very promising and make up for all the bad things of its predecessor. I got my copy of Windows 7 in December and installed it during the holidays over my existing Vista Ultimate 64-Bit installation. I still have a machine running Windows XP Professional, but Windows 7 does not support an upgrade from Win XP unfortunately. The upgrade process itself ran for the most part automatically. The upgrade wizard complained about a few browser toolbars that seemed to be incompatible and had me uninstall it. Among those was the Google Toolbar, which I did not uninstall (because the provided wizard could not do it and I did not want to remove it via the control panel and lose all my custom stuff). Anyhow, the upgrade went okay. I had to download a new version of the ATI Control Center, because the previous version had also be uninstalled due to incompatibility issues. After that all seemed to be fine, emphasis on SEEMED. One exception was Internet Explorer, which hang forever when I tried to start it after the upgrade. The problem was with the StumbleUpon browser toolbar, which was not seen as an issue by the upgrade wizard. I had to disable it manually and IE started fine after that. The freeware tool ?? ?Free Download Manager?? ?, which I use for larger file-downloads and other things also did not work properly after the upgrade. A file download that would have triggered the launch of FDM resulted in an error message claiming that the program was not configured properly. A re-install over the previously installed version did not fix it. I need to try to uninstall it entirely and then re-install it, to see if that will do the trick. My suspicion is that it will not, because of the other security settings issues that I experienced after the upgrade as well, but more to that in the next segment of my blog post. Windows 7 made changes to the system security management and behavior. It was already with Vista annoying as hell that even an account with administrator privileges and permissions still encountered situations left and right where required read/write/delete/execute permission were missing. I got most of those issues fixed in Vista already by disabling the security advisor and transferring ownerships of the Windows system folder inclusive files and sub folders to my main user account. The administrator account in Vista was disabled by default and it was suggested not to keep it enabled or use it. The same is the case in Windows 7. However, some of my old permission issues came back and also new ones appeared. I switched for many of the tools and programs that I use frequently to a portable version wherever I possibly could. This makes backups easier and also taking the tools with you to use on another computer via a USB thumb-drive. No registry mess that is created AND required for the program to run, no files are copied and sometimes replaced in the Windows system directories or ?? ?Common Files??? folder beneath ?? ?Program Files??? or ?? ?Program Files (x86)’???. Many of the tools store stuff, like custom user settings or last accessed files in the registry and uses them, if they exist and create new ones, if they do not. No problem, at least under XP and Vista; different story with Windows 7. Several of my portable versions don?? ?t work at all or crash, if I run them via my own user account with administrator permissions (and a member of the administrator user-group). I got most of them to work, if I right-clicked on the executable and selected ?? ?Run as Administrator???. That is annoying, especially, if you forget doing that first and the program loads and loads and then crashes to remind you of how it has to be started. After that other problems also appeared. For example if I started a tool as administrator, all my network mappings to the various network storages in my home network become inaccessible. This has two reasons, first of all are those shares not mapped for the ???Administrator??? user, but even if they were, is there also the problem, that I did not setup users with the name ???administrator??? with the same password as the password for the local administrator account at those network storage devices. Some programs became unable to store any files on the computer outside of the user folder (EG. My Documents). I don?? ?t have multiple users using my machine and always kept my documents in different folders in the root of the hard drive outside the ???Users??? (Vista/Win7) and ?? ?Documents and Settings??? (XP) folder, because of permission issues in some cases where one computer in my home network group was unable to access any user folder or system folder on another remote machine within the same network. Things that seem to be impossible to change with an administrator account that is not the user login ???administrator??? are settings stored in the registry, such as video and audio codec and filter configurations. This whole stuff was already a nightmare to cope with in XP, got a bit worse in Vista and even more so in Windows 7. Dudes at Microsoft, you are taking steps in the wrong direction here! Windows Explorer has the tendency to hang and crash more frequent than with XP, something that I noticed with Vista already, but became more severe with Windows 7. Cause: unknown. I can live with the fact that they moved the ?? ?Show Desktop??? button to the far right of the taskbar. What I absolutely hate are two other changes to the task bar. 1) The quick-launch bar/menu is gone entirely and was only replaced by the option to pin programs to the task bar, which is not the same. I had folders in my quick-launch menu and basically used it as an alternative and faster programs start menu with all the shortcuts to scripts and programs that I am using all the time. 2) The grouping of running instances of the same program used to be an optional feature and is now the default option without the ability to turn it off. The individual instances of a program can be accessed easier with Windows 7, kudos there, but this wasn?? ?t and isn?? ?t enough reason for me to abandon the option of not grouping instances altogether. Many changes to the start menu design and functionality are improvements, yes, but I hate how they did the tree navigation in the ?? ?All Programs??? section. You cannot make sub-nodes expand in fly-out menus anymore, but what annoys me the most is that sub folders beyond ?? ?All Programs??? are not being expanded automatically if the mouse pauses of them, as I specified it in the properties for the Start Menu. Other issues that I continue to have and which already started with Vista are related to my Bluetooth wireless keyboard and mouse from Logitech. The mouse simply stops working in the middle of things and won?? ?t come back in most cases until a reboot of the computer or by simply disabling and then re-enabling Bluetooth via the provided button for that on my laptop. The devices appear fine in the Bluetooth device manager, even after they stopped functioning. I believe that this is a driver issue, but are surprised that Logitech did not solve it yet after such a long time. Keep in mind that I had the same issue already in Vista and the latest ?? ?Set Point’??? software by Logitech installed. Internet Explorer does not track my browser history since the upgrade. The only items left there were my visits to web sites prior the upgrade. Not even the sites that I just visited in the same user session appear, including not in the section ?? ?View by Order Visited Today???. I always had my browser setting set to keeping the history for 999 days, except for SSL secured pages, which I did not track. I searched at Google and Microsoft?? ?s web site directly to find an answer to this issue, but was not able to find anything yet. My guess it that it is also a problem related to the changed security management in Windows 7, but this is just a hunch and not based on factual things that could proof that. Something that I just noticed while I was writing this blog post via Microsoft?? ?s free tool called Windows Live Writer (which I can highly recommend to anybody who blogs, regardless if you are using Blogger, Word Press, Movable Type or Live Spaces etc. It works with pretty much all of them). They seemed to have standardized it, because I think it always looks the same now. However, Live Writer had some extended tabs in that interface, for example to specify a URL to a file on the web instead of a local file, with preview option and all that. This is now gone and probably a side effect of the change to the open-files dialog that is build into Windows. Not so nice, but I noticed via my own programming of VBScript tools that MS changed their system open/save file dialogs with virtually every new Windows version. I have not figured out all the things related to the security issues with the new Windows 7 Operating System. If you know more about those things, please leave a comment for me and others who have the same problem(s). This would really be appreciated. Thanks in advance already! MS should never remove any of them entirely and always keep them there as optional feature. You might get away with replacing something with something entirely new and different, if the selling points and advantages and improvements of the new is so overwhelming that requiring the user to spend time to get acquainted with it is more than justifiable. I am sure that new things will come up along the way. What I posted here are just my experiences with the new Microsoft operating system after using it for just 2 weeks as a user, doing the same with the PC as I did before, without doing any in-depth tests or explorations of the system components (except where I had to in order to solve some of the problems that I encountered virtually from the start). I read some stuff about meta-tag(s) features introduced into the operating system with Windows 7, something I am really interested in myself, due to the vast amount of data that I piled up throughout the years to various subjects, including documents, source codes, images, videos, Zip/RAR archives etc. I could not find much in the system myself. Maybe I looked in the wrong places. I noticed that lack of some column types in Windows Explorer, which I really miss, such as ???Codec??? for video and audio files. Something I am still looking forward to. There must be something Microsoft really improved a lot with the new OS. PS. My Media Library issues are not solved yet to this day, although I learned a lot of what not to do and which tools and applications are more worthless than others. I am no Microsoft hater, although I am very critical about them. I still believe that they really try to make things better and that there is no evil master plan to make the life of millions of their users miserable. Next Post: Superior Art Creations Scene Art Pack Volume 36-SAC? !